Being a transplant to Michigan, I had never given much attention to Detroit or what was happening in the metro area before this last year. I first learned about the Detroit water shutoffs last June from an article that popped up in my Facebook feed saying that thousands of Detroit citizens would soon be without water. A few weeks later another headline stating that nine people had been arrested for blocking a Homrich water shut off truck. I began following the shutoff news more closely and I quickly learned about the Detroit Water Brigade, who caught my attention because of their Facebook page. The content posted on their feed illustrated this very grassroots, very personal perspective of the shutoffs. (I would later find out that some members of the Water Brigade were victims of the water shut offs as well.) This is how I decided I wanted to volunteer at the next opportunity. The first time I met the members of the Detroit Water Brigade was at their headquarters in Detroit for a dinner and discussion about the Water Affordability Fair. Some of the members I met that night included Justin Wedes, DeMeeko (Meeko) Williams, AtPeace Makita, and Beulah Walker. This dinner event was made in preparation for the Water Affordability Fair. It was also a chance for new volunteers like us to get acclimated with the work of the Brigade in addition to learning more about what we would be doing at the Affordability Fair that weekend. The dinner was cooked by two incredible women who had traveled all the way from Salt Lake City. They had just gotten into town with a U-Haul truck full of water to donate and were staying to help during the Affordability Fair. We got to know one another while we ate, and conversation eventually brought up a very honest discussion about race because many of the new volunteers were white and many of the folks affected by the shutoffs, for whom we would be advocating, were black. It was a safe environment for folks to voice any concerns, doubts, or confusions they may have had. It was great to have that out in the open and really address racial tensions or issues head-on before we advocated for folks. I left that meeting inspired and decided to make a unique contribution to the group. I used imagery from the Brigade’s website to create buttons that had their logo, website, and phone number which could be passed out at the upcoming event. I made approximately 200-300 buttons for this first event. First set of buttons I made for the Detroit Water Brigade. My partner, John; our friend, Brian; and I arrived at the Eastside Customer Service Center in Detroit – buttons in hand – to meetup with the Water Brigade. The empty lot beside the Eastside Customer Service Center, where the Water Affordability Fair was held, was full of tables from many different water and social organizations, including the Detroit Water Brigade. The Brigade had a table with information handouts and water, a DJ, table with food and snacks, and a tent with chairs and activities for kids. This fun atmosphere was perfect for improving spirits of those present who were currently trying to avoid shutoffs and or get their water turned back on. The police were also present during the event. The Detroit PD had dispatched several officers who spent the duration of the event near their armored vehicle or riding horses around the lot. John standing in front of police vehicles. The Water Affordability Fair was hosted by the Detroit Water and Sewage Department (DWSD). The intent of this event was to provide an opportunity for folks to pay their water bills and find assistance for those who had a “legitimate financial hardship”. However, to hold this event would make the downtown Customer Service Center, which was normally open on Saturdays, close for the day. The role of the Water Brigade that day was to be available for any folks who wanted an advocate with them while they spoke with the DWSD regarding their bills. We would not provide any financial advice to people, tell them what to do, but just be there to ensure that what they were being told was consistent with what other DWSD representatives were telling customers. Unfortunately, the DWSD refused to allow Water Brigade advocates into the session with customers, even with the customer’s consent. Water Brigade volunteers ended up using the fair to go canvassing in the neighborhood and pass out free water, coolers, and other supplies to those who were without. Upon arrival we were met by Justin Wedes, a co-founder of the Water Brigade. He gave us orange vests and put us to work right away! As John and I were unloading a nearby van full of donated bottled water, I could hear the excitement of buttons being passed out behind us. Within minutes every orange vest was sprinkled with at least a couple of the buttons I had made. The best part was when neighborhood kids came by and decorated themselves with buttons. We truly had a brigade that day, including some younger members from the community! John, Brian, and I stayed until the end of the event, taking on many roles throughout the day. It was not uncommon to be passing out popcorn for kids in one minute and loading cases of water into a nearby car in the next. What was incredible about this event was that people from all over the U.S., from Utah to New York, were so moved by what has happening in Detroit and had decided to come and lend their time and give water. Not only were outsiders willing to lend a hand, but there was a true sense of community from Detroiters. Many local folks also stopped by to drop off water and provide kinds words and support. It was incredible to witness. I volunteered again with the Water Brigade again shortly after the Water Affordability Fair. Brian and I drove to Detroit on a Sunday to meet-up with Justin Wedes and canvass along the Riverwalk Park. We handed out information cards and buttons and spoke to people about shutoffs, resources, and volunteer opportunities. A majority of the people we approached were very positive and empathetic towards those affected by the citywide shutoffs. Many even had personal stories to share of an relative, friend, or neighbor who had gotten their water shut off. Only a couple people made comments about how they are able to pay their bills therefore others are too. Today we hit the Riverwalk to talk to Detroiters about the #DetroitWater crisis & how we can help. I spent the next few months supporting the Brigade by continuing to make them buttons, volunteering at any events that I could, making small donations, and sharing their Facebook, Twitter, and (later) Tsū. As summer faded away, we were facing the very real situation that many Detroit citizens may be without water during the fast approaching winter months. On September 22, I took a vacation day from work and Brian and I headed to the Theodore Levin Federal U.S. Courthouse in downtown Detroit to watch testimony from those involved with and affected by the water shutoffs. The DWSD along with local citizens were among those who spoke that day. The purpose of this session was to try and prompt Judge Rhodes to intervene with the water shutoffs and prevent more people from getting their water turned off. It was seen by many, including Rhodes, that Mayor Mike Duggan’s 10-point plan did not help those who “chronically do not have the means to pay”. In the end, Judge Rhodes still chose not to intervene, even after acknowledging that the plan was likely not doing enough for the 40% of the Detroit population living in poverty. One of the biggest shocks from the testimonies came from the DWSD director, Sue McCormick. When asked if water is shut off to homes of children, elderly, sick, or disabled, McCormick could not answer this question saying the DWSD did not have that data. Basically, the DWSD did not have any measures to ensure that water was not being shut off to high-risk individuals. Sadly, this was one of many things McCormick was unable to answer regarding the DWSD. Meme featuring Sue McCormick, Director of DWSD. Other shocks came from hearing personal stories of those who were affected. It was heartbreaking to hear how much families were suffering from these shut offs. Additionally, the way the DWSD handled the shutoffs was also quite unsettling. They would mark the front of people’s home to indicate that their water would be shut off, like a scarlet letter, but painted on their curb. DWSD also hired outside contractors to do many of the shutoffs, and these contractors often failed to follow DWSD guidelines on speaking with residents before shutting of their water. The contactors had just shut off water with no prior contact. One shining note from the testimony was listening to consultant, Roger Colton, who illustrated practical payment plans that would help low-income and poverty level citizens rise out of their water debt. What was most interesting to me, was that Colton had made this plan almost a decade ago for Detroit, but it was rejected. Colton’s plan differed from Duggan’s 10-point plan in that it did even more to help those who were in poverty, and again, roughly 40% of Detroit citizens are currently in poverty. Following Judge Rhodes’ decision not to stop the shutoff prompted the United Nations to come to Detroit and assess the water situation. Two Special Rapporteurs, Catarina de Albuquerque and Leilani Farha, came to Detroit to get a first-hand look at the shutoffs and report out their findings. A town hall meeting was also set-up to provide an opportunity for Detroit citizens to speak directly with the U.N. representatives. I attended this town hall meeting which took place at Wayne County Community College on Sunday, October 19. One thing that caught my attention was that there were many folks who explained how they often had make the impossible decision of choosing to pay the water bill or to pay rent. It was also incredible to hear the lengths at which people had to go in order to get water and sustain their lives, from traveling across town to gathering water from rain barrels. 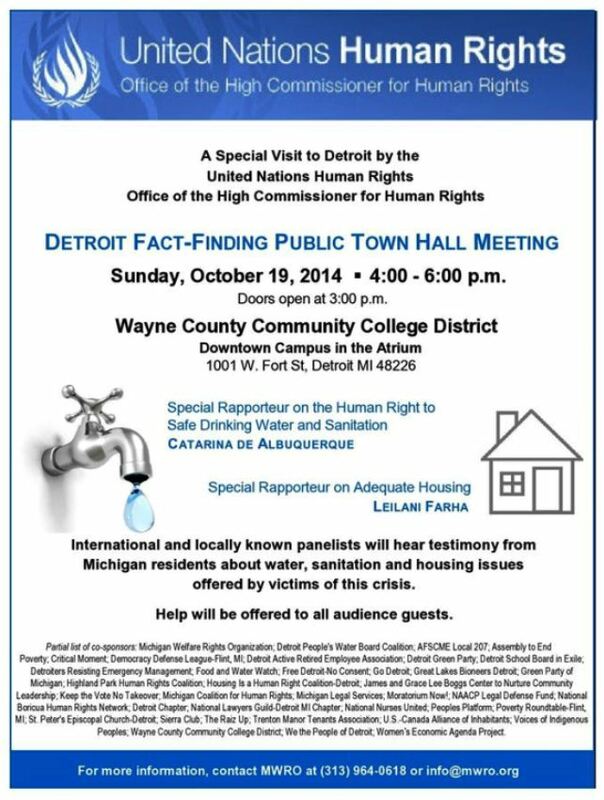 U.N. Town Hall Meeting regarding the Detroit water shutoffs. “We were shocked, impressed by the proportions of the disconnections and by the way that it is affecting the weakest, the poorest and the most vulnerable,” said Catarina de Albuquerque, the U.N. special rapporteur on the human right to safe drinking water and sanitation, at a press conference on Monday. The U.N. representatives released a statement to Detroit officials urging that the water be turned back on because it was a human rights violation which disproportionately affected poor and African Americans. However, the shutoffs continued through the fall and winter, even after this U.N. statement was released, with Detroit Mayor, Mike Duggan, stating he was “disappointed” in the U.N. findings. Meme featuring Detroit Mayor, Mike Duggan. As the shutoffs continued in Detroit, things were heating up in Ireland regarding new water charges to be paid by citizens. People were not only mad about the new charges, but also that the Irish Water system had previously failed to provide safe, clean drinking water in the past, and people did not want to pay for potentially contaminated water. On November 1, 2014, Irish water protesters has organized over a hundred events across the county to speak out against water charges. The Detroit Water Brigade braved the severe Michigan cold to stand in solidarity with Irish protesters on this day. There were even people in Windsor, Canada who had signs and banners in solidarity. We stood with signs in front of the “Spirit of Detroit” statue and marched on the streets and finally into the GM building where, unbeknownst to us, the Youmacon anime convention was currently being held. A little civil disobedience goes a long way, and while we were being kicked out of the convention, we were chanting our message to the hundreds of – fairly receptive – anime fans and cosplayers. Ireland would remain a great ally and only a month later, representatives from the Detroit Water Brigade would be flying to Ireland to show their support. I got a chance to send the Brigade members off at the airport and to give them a fat sack of buttons to be handed out our new Irish friends. This half of 2015 has brought about some big changes for the Water Brigade. In the early part of the year, they made waves on the social network, Tsū, which pays users a small amount for posting content. The Water Brigade’s Tsū was popular internationally and earned over a thousand dollars in donations to help support those without water. The Detroit Water Brigade’s Tsū page has since transitioned into the page for the Detroit Workers and Builders, when Co-founder Justin Wedes recently stepped down from the Detroit Water Brigade to create this new organization. Wedes’ vision of this group is to help Detroiters rebuild Detroit and their first goal is to raise enough money to purchase and renovate the vacant Larned Elementary School into the House of Help Community Center. As the Detroit Water Brigade moves forward and the water shutoffs continue, it’s been bittersweet to look back at the past year. The Water Brigade went from a grassroots cause to something that blew up bigger than we all could have imagined within this last year. I’m still in shock when I think of all the support we have gotten from folks, even celebrities. The water shutoffs have caught the attention of Chuck D, Mark Ruffalo, Detroit Lions player DeAndre Levy, and even The Daily Show with Jon Stewart. The work is still far from over, however, as we press on through the remainder of 2015. The shutoffs continue in Detroit and the DWSD has even proposed new water rate hikes. Water issues are starting to creep into the suburbs and other parts of Michigan. Residents in Flint have been dealing with brown, contaminated water since April and the water was almost shut off to all residents of Highland Park. As water issues continue to plague the United States with shutoffs in Baltimore and drought along the west coast, the progress the Detroit Water Brigade has made has been invaluable and I hope we can help lead in the fight for water. I look forward to the progress that will be made this year and plan to continue volunteering with the Brigade until these shutoffs stop. Detroit Water Brigade button. [Image credit: Justin Wedes].